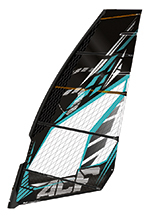 The AC-F sits in the Point-7 range as their freeride sail, designed specifically for fun and user-friendliness. 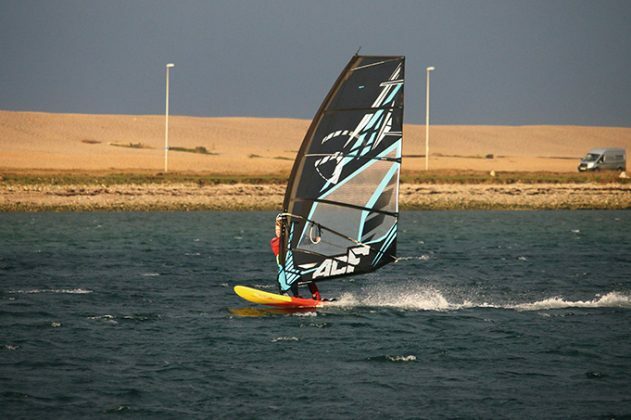 Whilst its stable-mate, the AC-X, is focussed on providing race-like performance in no-cam form, Point-7 are quick to make the distinction that the AC-F is targeted towards “light wind qualities over high wind performance.” Featuring five battens in all but the largest size, it is a grand sail in proportion, with both the largest boom and one of the longest luff increments in this test group. Built well, with a high level of detailing (including some unique Allen-key batten tensioners) it certainly stands out, with use of the brand’s signature black monofilm and x-ply panelling. Using a 430cm RDM, the AC-F is straightforward to rig, requiring a reasonable amount of force to counter its moderate luff curve and apply the downhaul required, guided by the visual aid in the top panel. It sets incredibly flat at rest, with the slightest profile evident in the front of the main batten above the boom, the battens free from any rotation around the mast. With such an exclusive appearance and set, it would be interesting to see how it translated to performance on the water. With its large increments, it is not surprising that the AC-F feels every bit a 6.5m in the hands, providing positive useable feedback through the backhand as a gust hits. It is a unique sail in the group, with a shallow draft and only a moderate amount of movement bestowed in the sail’s leading edge by the luff-tube and panels. Instead, it relies on the leverage delivered by the boom’s length, which is some 16cm longer than others in the group – a significant amount. And yet, it works … and works well. The AC-F is physically light, meaning its leverage doesn’t feel cumbersome or overbearing. 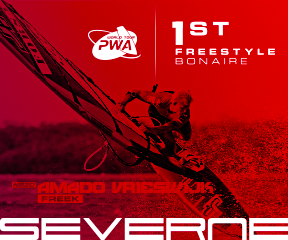 Pull in with the backhand and the sail delivers the power effortlessly to the board, accelerating smoothly and settling into a secure upright stance. The centre of effort is high and forward in the draft, which combined with a high clew eyelet position, makes for a naturally high geometry. And yet, the part of the AC-F’s performance that really took our breath away was discovered when the wind increased. When you’d be forgiven for thinking that the AC-F would have control issues in overpowered conditions, its thoroughbred DNA began to shine through. Comfortable and balanced in the hands at all times, as a gust hits and pressure builds, the AC-F simply seems to transform it into more speed. It feels slippery and exciting through the air, particularly off the wind – a real tutor for those with aspirations for a blasting style without forging down a dedicated path too soon. In transition, the Point-7’s size is again apparent, rotating slowly between tacks, although its lightweight and predictable power delivery makes it easy to manage. With looks that can deceive, the AC-F uses its form in the best way possible, and exhibits plenty of blasting performance to explore when the wind turns on.